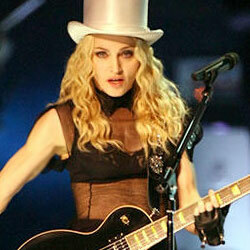 Madonna (born Madonna Louise Ciccone on 16 August 1958 in Bay City, Michigan, is an American singer. Madonna's music singles include, Like a Virgin, Papa Don't Preach, and Music. She has won multiple Grammy Awards. Madonna is the world's top selling female recording artist of all time, and inducted into the Rock and Roll Hall of Fame in 2008. Madonna is featured in the Louis Vuitton 2009 Spring campaign, Dolce & Gabbana in 2010, and in 2012 launched her own fragrances.